Driving is something that has always made me nervous. The concept of being able to drive never excited me and because of this I was never enthusiastic about having lessons or even passing my test. I had no passion for it and the lessons I had were boring to me - just another two hours out of my day. I've always lived in places that never left me "stuck". I've been lucky enough to live in areas that enable me to easily access shops, banks, restaurants and other sources of entertainment without the need to drive. Despite this I'm now starting to regret giving up on driving so soon. Being behind the wheel of a car terrified me. It's strange because being out of control in a situation usually triggers anxiety for me, but being completely in control of a car made my anxiety flare up to the extreme. I would constantly panic and my natural response to panic is to remove myself from the situation. In terms of fight or flight - I always fly away. Obviously, you can't do this in a car, but once my panic set in I couldn't do anything. I would take my hands off the wheel, my feet off the pedals and let out a little high pitch squeal until my poor driving instructors (I had 3 of them!) took over to stop us from crashing. I'll admit, I was definitely not the easiest of students to teach. However, my confidence plummeted after my first driving instructor completely discouraged me. He would shout and become easily frustrated when it took me more than a couple of tries to get something. He would shout at me to "stop panicking" and for those of you that experience panic/anxiety, you'll understand that just "stopping" is a lot easier said than done. By the end of my first few lessons he told me that driving was not for me and that I should either give up or learn in an automatic car - not the kind of encouragement I needed. Although my next two instructors were so amazing and much more patient with me, that initial discouragement stuck with me and I never felt good enough. Being told that you should give up after your first few lessons because you're instructor doubts you'll ever improve is the worst kind of criticism in driving. For this post I've teamed up with BookLearnPass to encourage you guys to get out there and learn to drive! Don't let anybody tell you that there is a limit to your abilities. I feel that if I had not had that original instructor that I would have passed my test by now. The lack of confidence I had in myself enabled these negative discouragements to get to me and eventually make me give up. I don't want any of you that are learning to drive feel the sense of panic/anxiousness that I did from thinking that I wasn't good enough. Learning to drive takes time. You won't improve much over the first few lessons, I know that now, but over time you will get there and it will come naturally. That's how everyone else has done it and that's how we will too! After I'm finished at University, I plan to start my lessons again. I'm moving to the centre of a large city in a month so I'll have no need to drive there, but it's something I definitely want to pursue in the future. BookLearnPass will definitely be a driving website that I will be looking at first. They provide lessons all over the UK and even give you the option to do intensive courses (something I will be looking into)! They also offer theory and mock theory tests to help you along the way to getting your license! My advice to any of you learning to drive or who are about to start, whether it's for the first time or you're trying again, is to remember that you will be able to do it in the end! I know now that everyone is different. Some people can learn in a few months and for others it can take a few years. Take your time, don't push yourself too hard, and just try your best. If in the end you decide that driving isn't for you, that's ok too. Driving is a personal preference and not everyone needs it, especially if you're living in a city where driving isn't even necessary! What's your opinion on driving? How was your experience with it? Let me know in the comments, I love to hear from you all! I was scared to drive at first as well, but determined. It looks like you are off to a great start! I was such a bad driver in the beginning. the only thing I was quite good at was parking. But don't worry you'll get better everytime you drive. And I suppose streets here in Italy are even worse!! I was the same, driving didn't excite me at all but I drive quite a lot now and I've learnt to enjoy it, it just took me 5 years!! Very interesting post. I never really liked driving. I've always said one we make millions I'm hiring a chauffeur - haah! I'm sure you'll get over this anxiety in time though. Thanks for sharing! This post totally finds me agreeing! I took the driving license when I was 24 (4 years ago) because driving gave me anxiety and I remember when I was 18 I was the only one who wasn't excited about having lessons, taking the license and driving a car. Since I had the license, I've been driving only few times, because, as you, I live in a city where I can easily move by walking or by bus/train. Buuut...I was tired about being the only one I knew who didn't drive at all, plus I and my bf have just bought a new house and this is in the countryside. So, no excuses, I have to drive. I am practicing right now that people are away for holidays and streets are not so crowded. 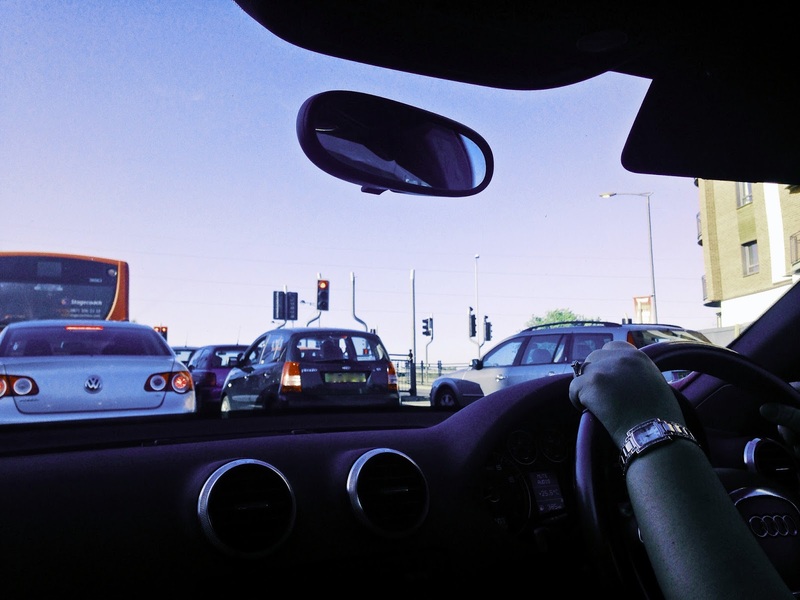 Unlickily, for all like us, the only way to stop being anxious about driving is...driving. So, thanks for sharing this post and good luck with your driving practice! i have major fear!!!! motivating! What a great post love - good for you for speaking out about this too! Not everyone loves driving and it's great that you're taking the right steps to helping you feel more confident behind the wheel! Gosh I still get driving anxiety, 7 years after I started driving. I just can't embark on a drive I haven't been on before without totally over-planning it, and I hate trying to find a park! So I totally get what you mean. I understand what you mean about not wanting to drive. I am 21 and still have no interest in it whatsoever! I'm so happy for you and proud to be able to over come your driving anxiety!